As we make our way towards the end of September, I'm starting to develop some serious seasonal FOMO towards my east coast friends as they experience all the trademarks of transitioning into autumn. The flame-colored leaves, toasty spiced drinks, and that slight chill in the air that brings out everyone's most fashionable attire. Do you know how long it's been since I've worn layers? Here in Thailand we get two seasons: wet and dry, and they're pretty much the same minus the higher probability of getting caught in a merciless rainstorm (I've seriously been considering buying a pair of Crocs as a result). If I were still living in New York, I'd probably be planning an escape upstate right about now. With no work holidays between Labor Day and Thanksgiving (depending on how your employer feels about Indigenous Peoples' Day and Veterans Day), I usually need a little weekend trip somewhere in between to tide me over until the holiday season is in full swing. 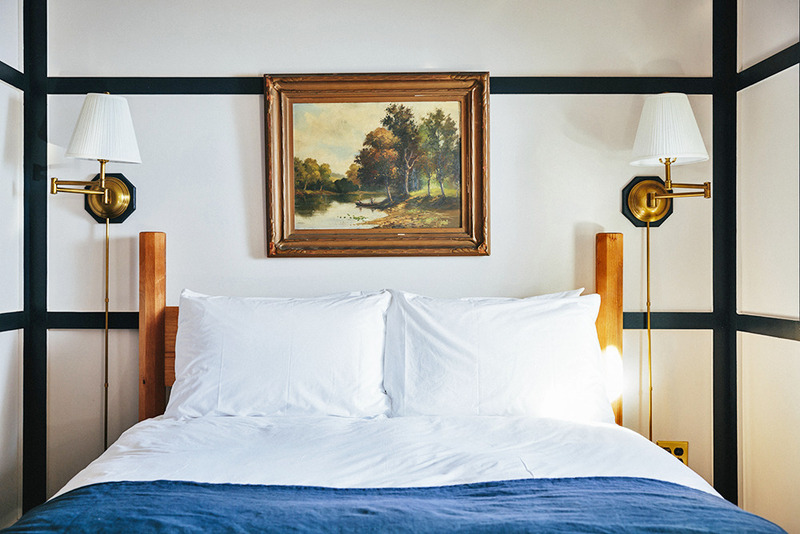 Plus, if you asked me, I'd tell you that I think upstate New York is where some of the most exciting things are happening in the American lodging and hospitality game right now. 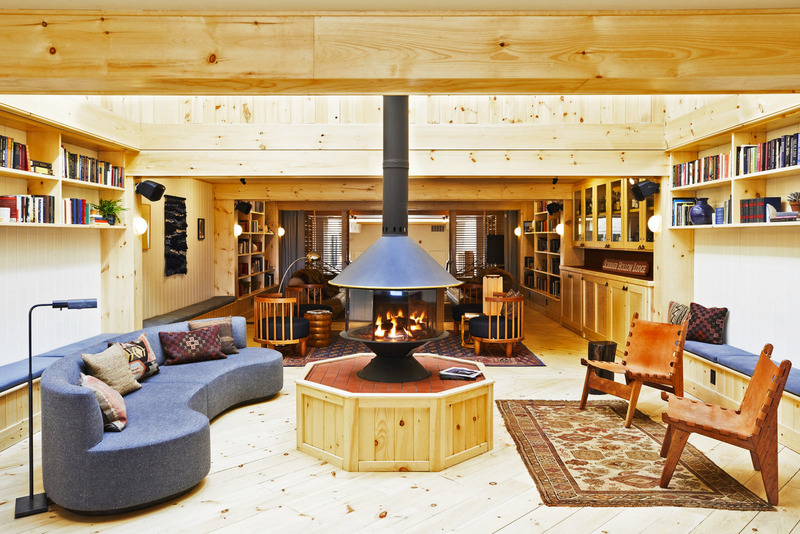 What was once a landscape dominated by grandeur ski and lakeside resorts for wealthy families has now been balanced by stripped down farmhouses, resuscitated motels, and cozy cabins catered to couples and groups of friends. So even if you're not based near New York, maybe the next time you hit up the big apple, you can make a detour to go apple picking instead (Ha! See what I did there?). 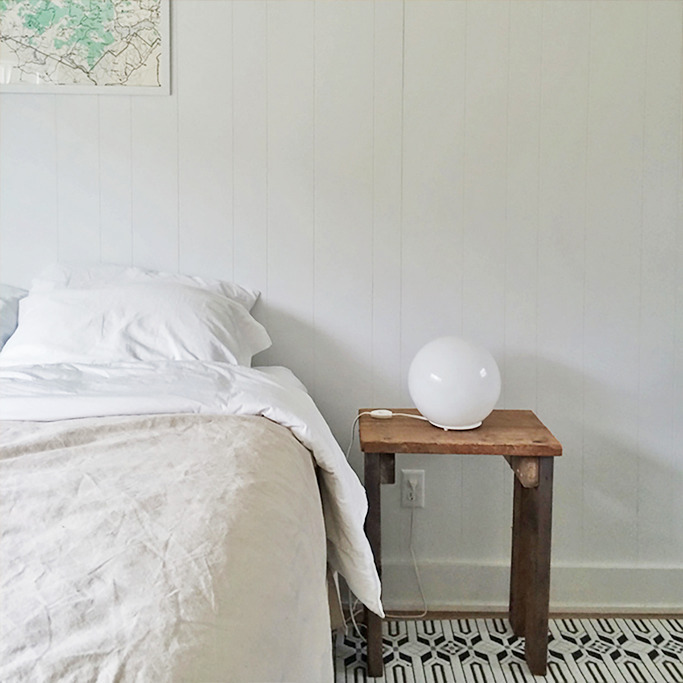 Below are my top choices for places to stay all across upstate New York. Rates are based on a weekend stay in October or November 2018. The Bull & Garland is an English pub and inn located in the Catskills town of Hobart, which is often described as "bucolic", "storybook-like", and is notable for its many bookstores. The building which Bull & Garland occupies was formerly a coaching inn built in 1830s (a coaching inn catered to those traveling by stage coach and often included a stable for the horses). One of the owners of the Bull & Garland previously managed pubs in London before settling down in the Catskills. 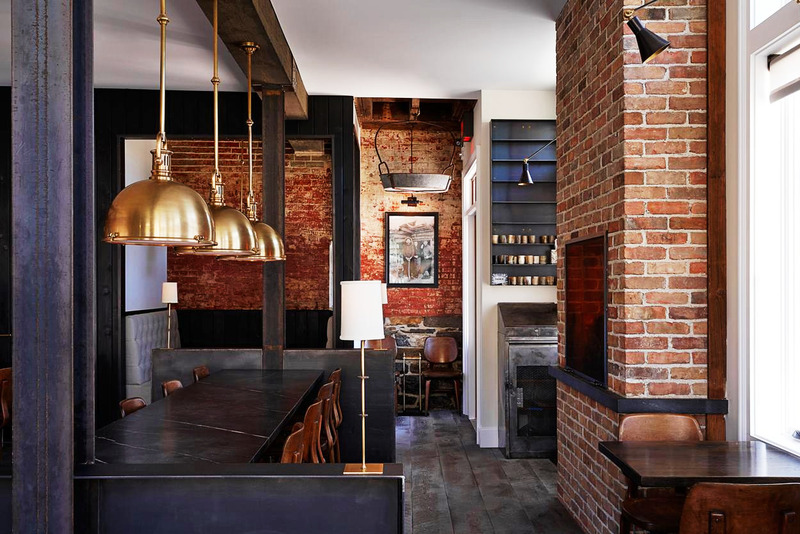 The inn's accompanying pub is open from Thursday to Sunday for dinner. 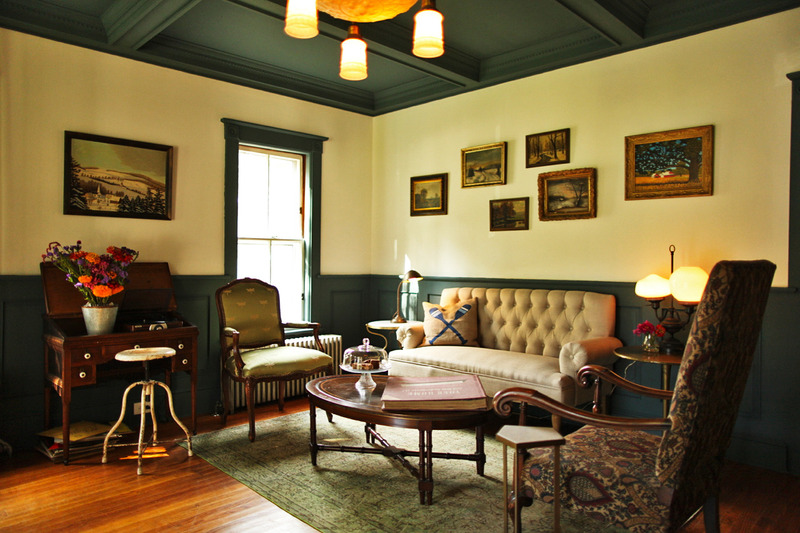 Three of the four suites at The Bull & Garden are located on the second floor, while The Victoria is located on the ground floor. Brentwood Hotel is located right off the historic Saratoga race course, America's oldest racetrack. 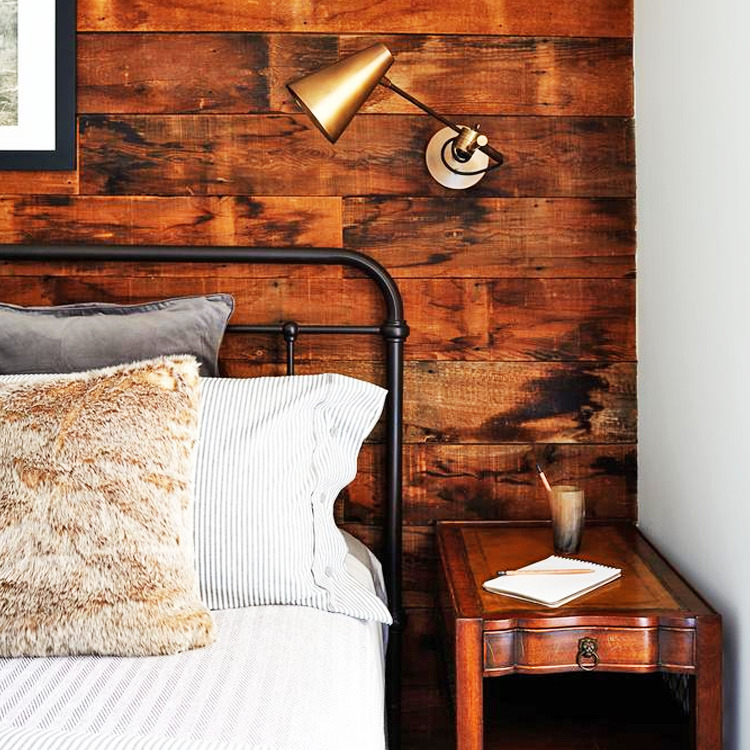 The building itself was originally a motel which has been refurbished by Brooklyn-based Studio Tack, which you may know as the people behind those cute Public—Supply notebooks. They're also the team behind Scribner's Lodge, also on this list. The hotel has a lot of subtle equestrian touches; it's like the horse girl all grown up. 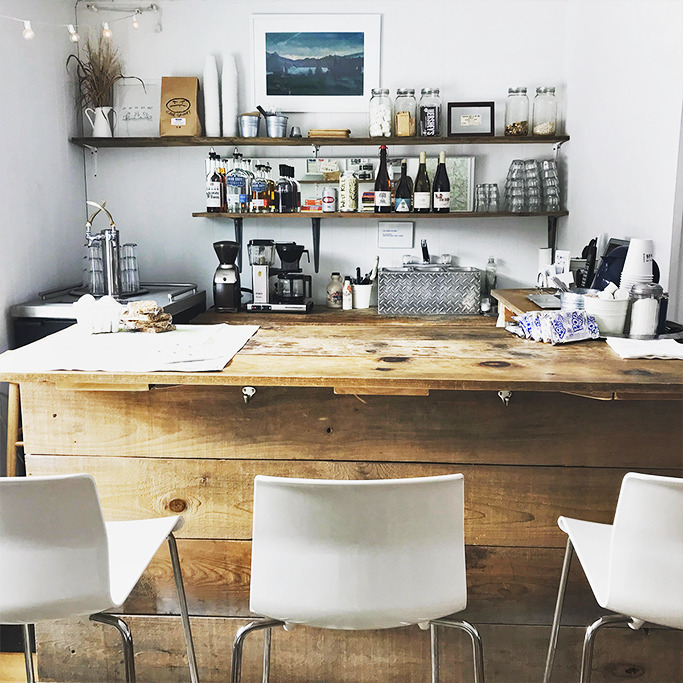 Your stay includes complementary coffee in the hotel lobby as well as free use of Linus bikes for exploring the town and nearby mineral springs. All rooms are located on the ground floor, accessible via a gravel lot. This place is so stinkin' cute and perfect for groups. 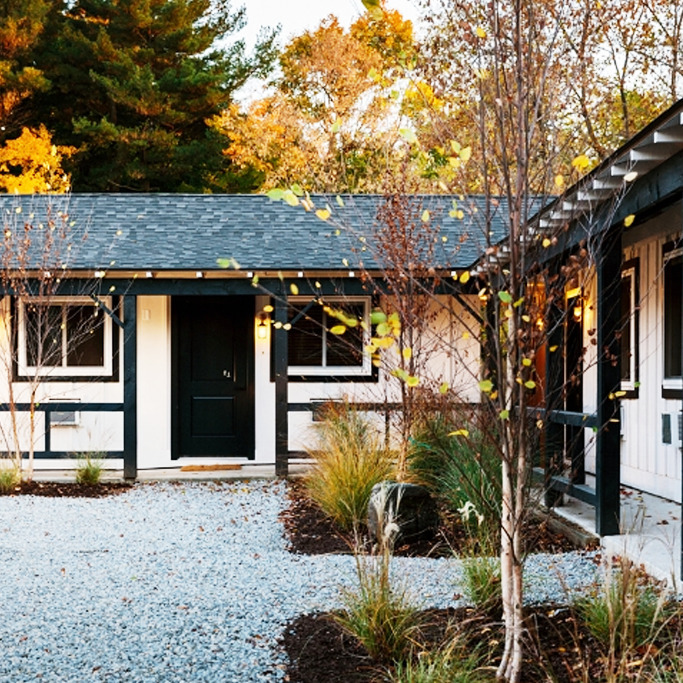 It's the upstate home of one of the founders of Heyday, a facial spa chain based in New York City. 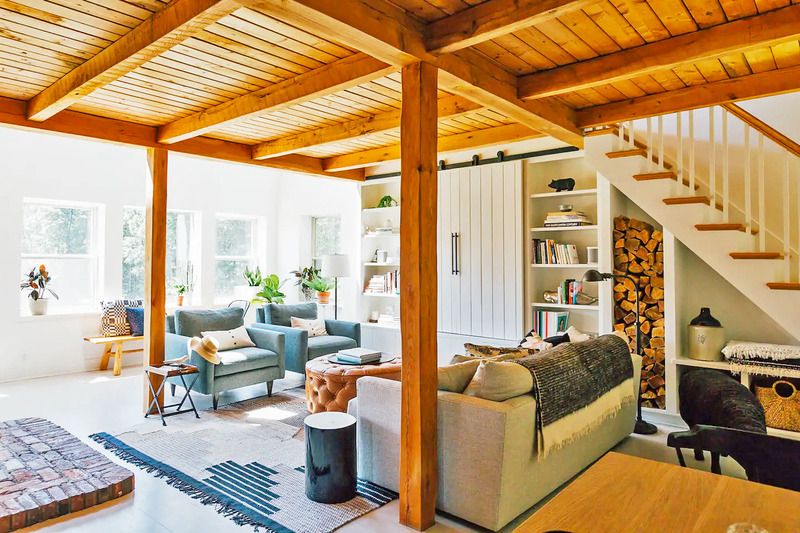 The lumber and gravel used in the house were sourced from local pine trees and quarries, and the home is situated in the middle of a meadow which fills up with fireflies at night. With its many big, bright windows and surrounding trees, this is an especially perfect place to witness the leaves change in the fall. The home is located on an elevated platform, without paved road access. 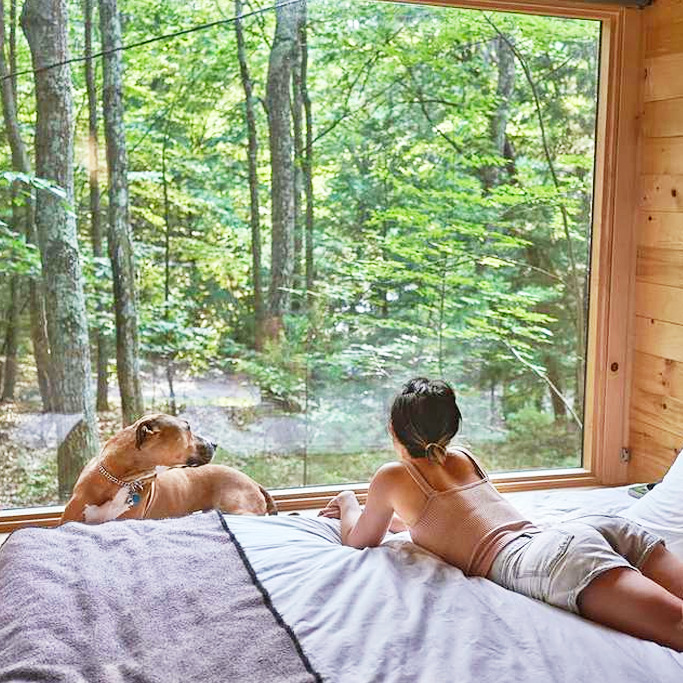 Getaway operates three outposts outside the major metropolitan cities of New York, Boston, and Washington D.C. Each outpost is outfitted with a selection of minimal, sleekly designed, pet-friendly camper cabins that are perfect for 2-4 people. 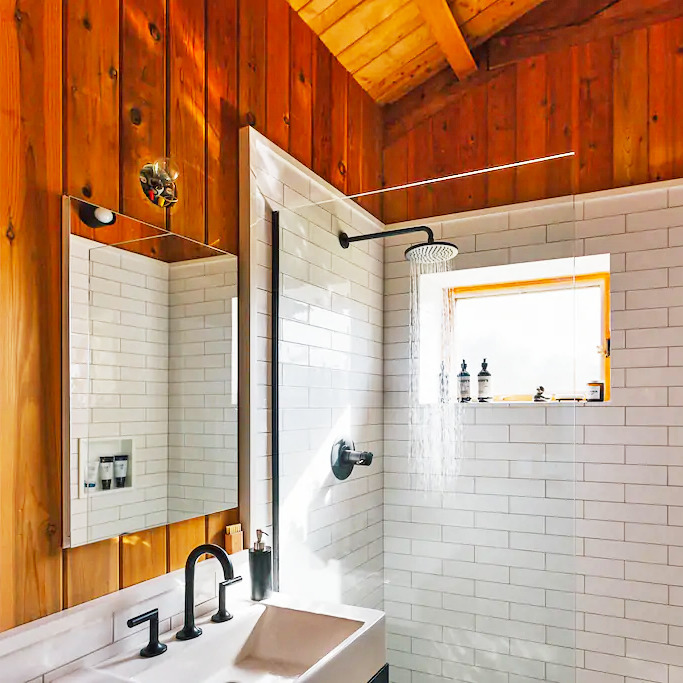 Each cabin comes equipped with a mini-kitchen and drinkable water, as well as a toilet and hot shower with biodegradable toiletries. 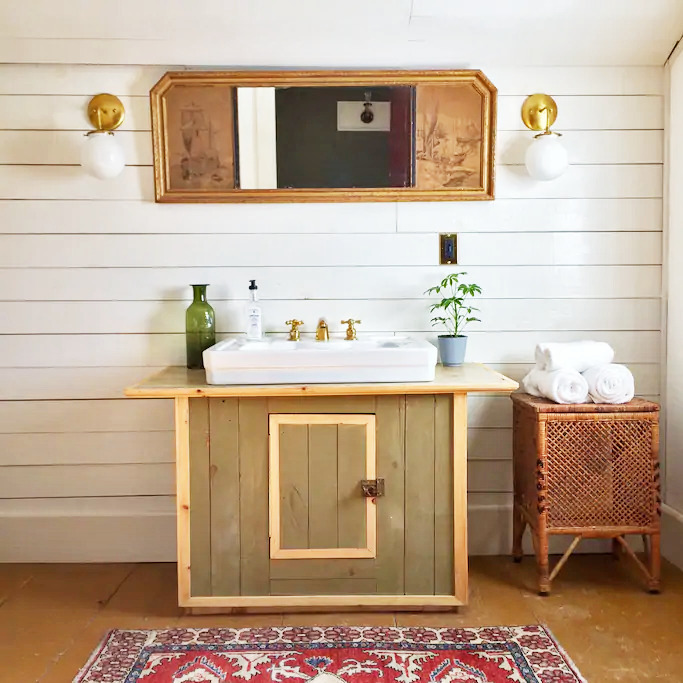 The exact location of each outpost is kept a secret until a week before your booking, in order to dissuade guests from over planning their trip. 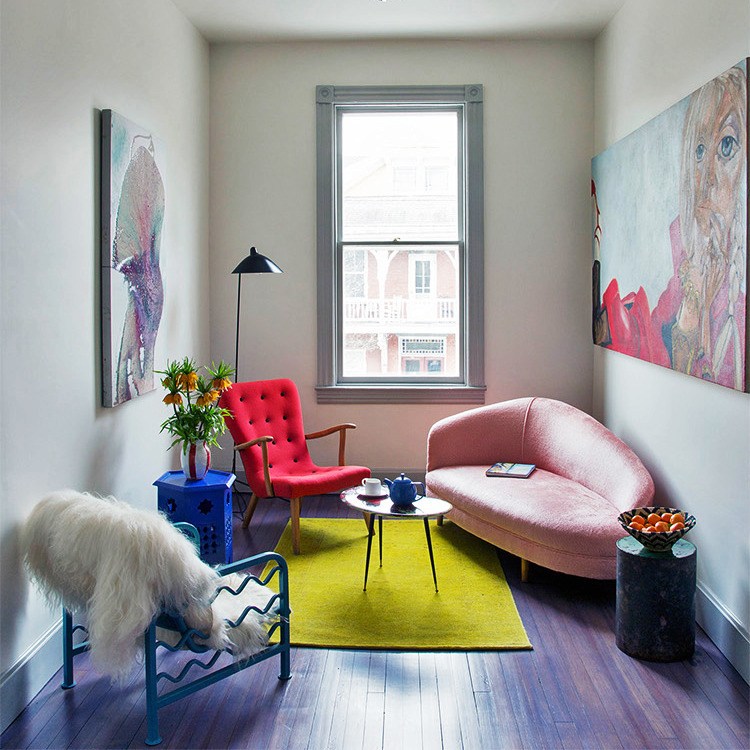 Getaway also offers an artist residency for creatives who need a little unblocking. 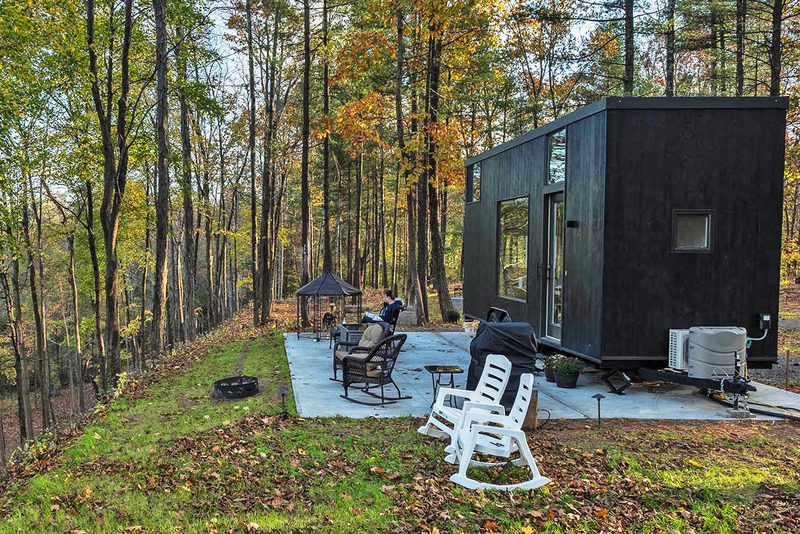 Getaway cabins are elevated and accessible via a short flight of stairs, and surrounded by unpaved grounds. 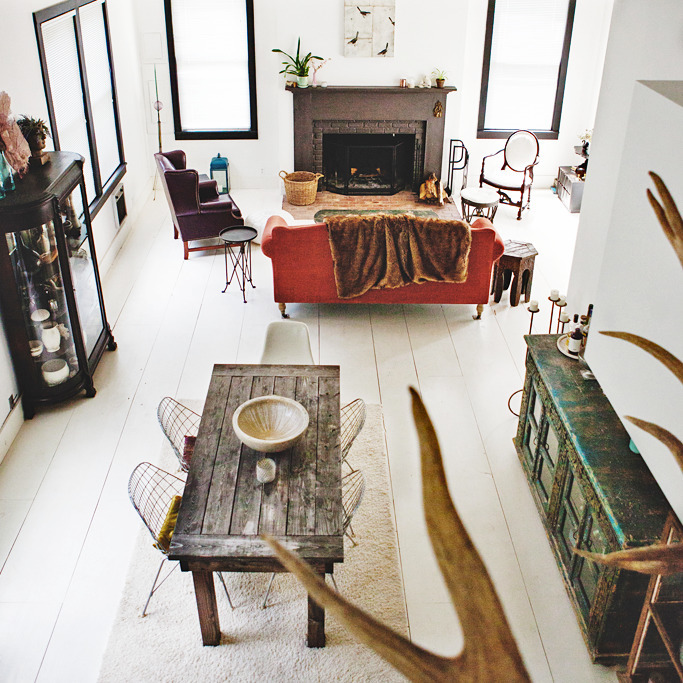 Foxfire Mountain House is the dreamy little love nest of a nomadic chef and a television producer. 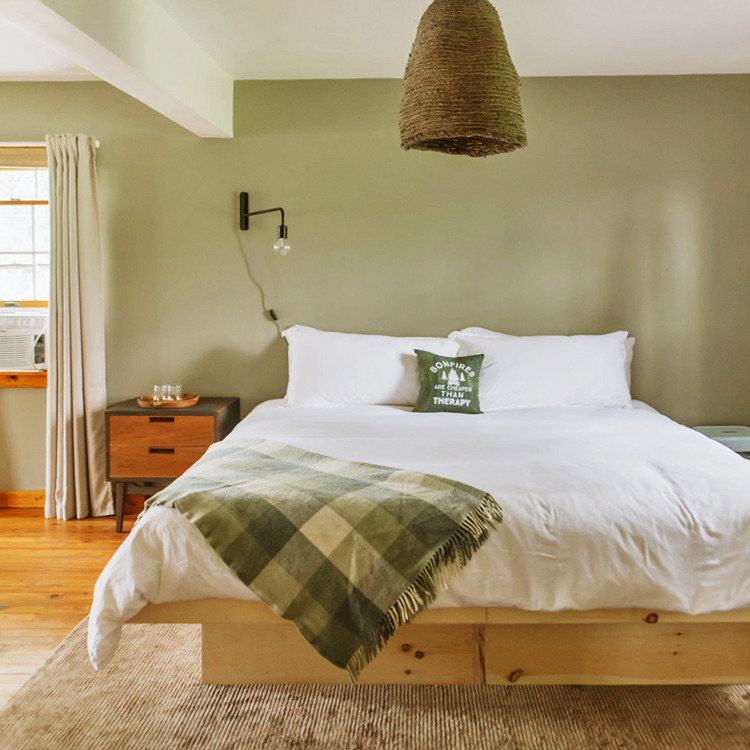 They renovated the 100 year old building in the Catskills, which now houses eleven bookable suites for guests, as well as a pet-friendly three-bedroom cottage. 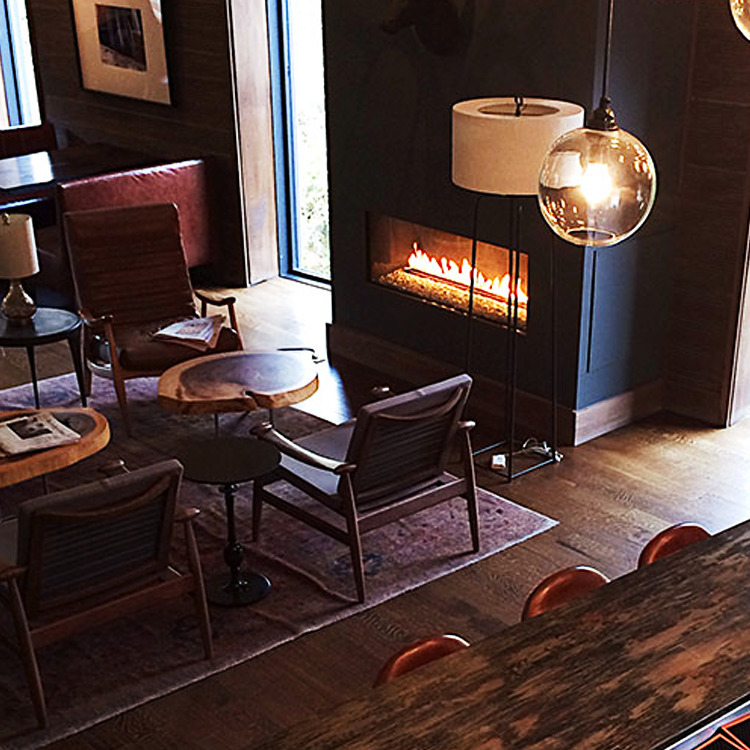 Dinner is available in the Bar Room on weekends and a complimentary Nordic-inspired breakfast is included with your stay. Please contact the inn directly for more accessibility information. Please enquire directly with the property for accessibility details. Formerley a vacation resort known as "Schwarzenegger's Sunshine Valley House" (yes, that Schwarzenegger), now Spruceton Inn, a renovated and minimalist motel smack dab in the middle of the Catskills. 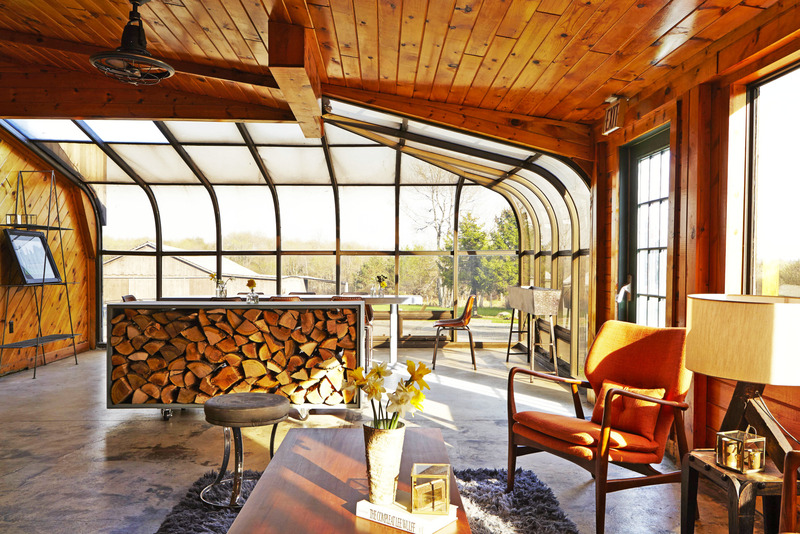 The inn houses nine rooms (some with kitchenettes), five fire pits, a bar/canteen, and an events barn whose construction was originally started in the 1800s. 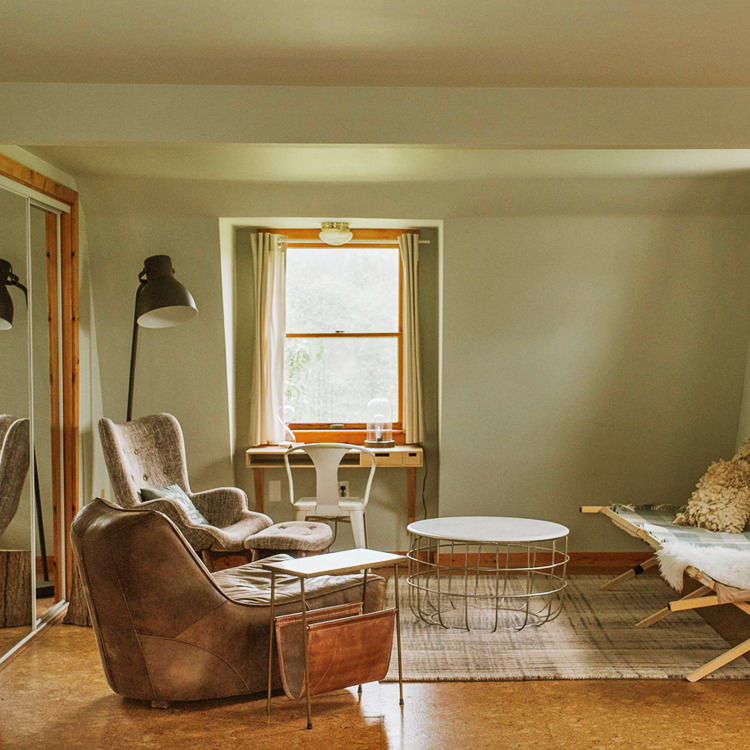 Owned by a designer and an illustrator, it should come as no surprise that the Spruceton also offers a week-long Artist Residency during the winter months for those who seek a quiet, inspiring place to create. Units are located on the ground floor, however accessible via an unpaved road. If you ever drive through Hudson, it's hard not to notice the brilliant white corner building that Wm Farmer and Sons occupies. 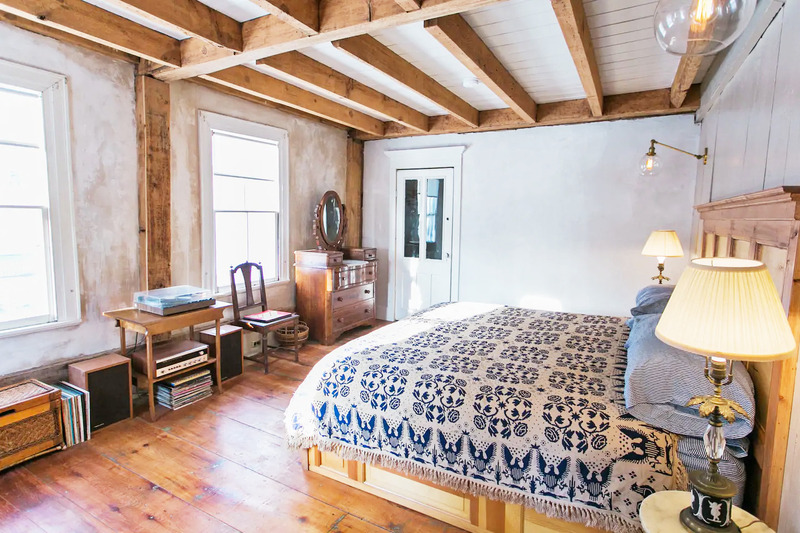 The Farmer family bought the 19th century building and former grocery in 2013 and spent two years renovating it into the guesthouse it is today. 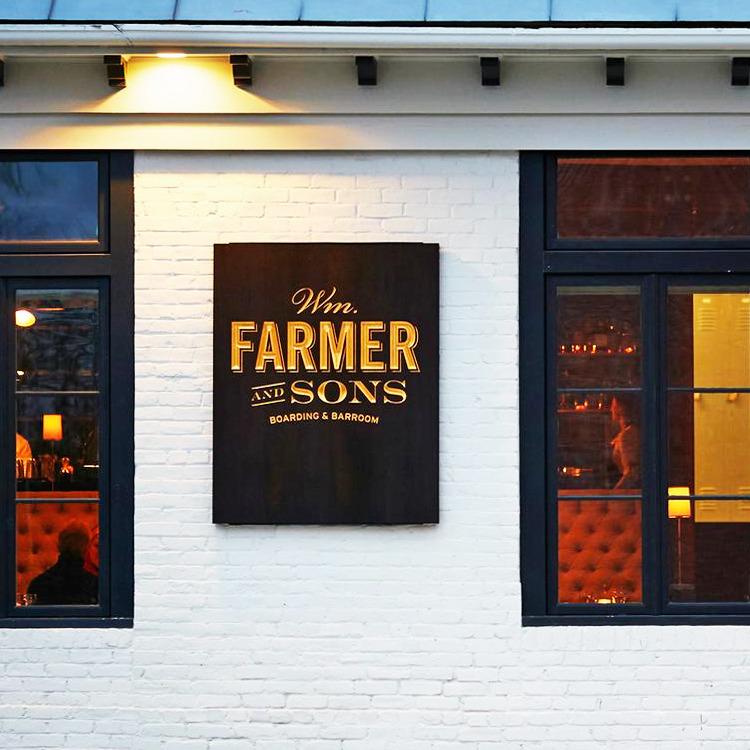 Wm Farmer and Sons now consists of 13 bookable spaces across three buildings, all decked out in a dark and cozy color scheme with rich wooden accents, clawfoot tubs, and gas stove fireplaces. Wm Farmer & Sons has two ground floor units in their "Annex Suite" next door the main building. The Hotel Tivoli is owned and operated by two painters, Brice and Helen Marden, who are apparently a big deal in the art world (but hey, it's okay, I don't know who they are either). 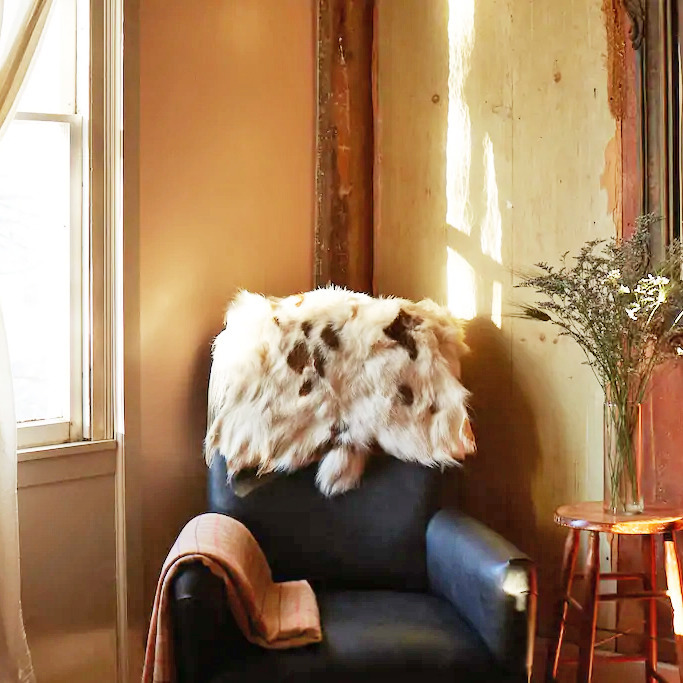 The pair bought up the Tivoli when its former incarnation, the Madalin Hotel, shut down— and their local neighborhood hangout along with it. The Mardens gave the hotel a colorful makeover, including a unique purple tint to the wooden floors, and also re-did the restaurant which now features a mediterranean-inspired menu and cocktails designed by the team behind NYC bar Employees Only. All units are located on the second and third floors in a building with stairs. Scribner's Lodge is the third life of a site that was originally home to a grand 1880's hotel, and a 1960's motor lodge long after that. 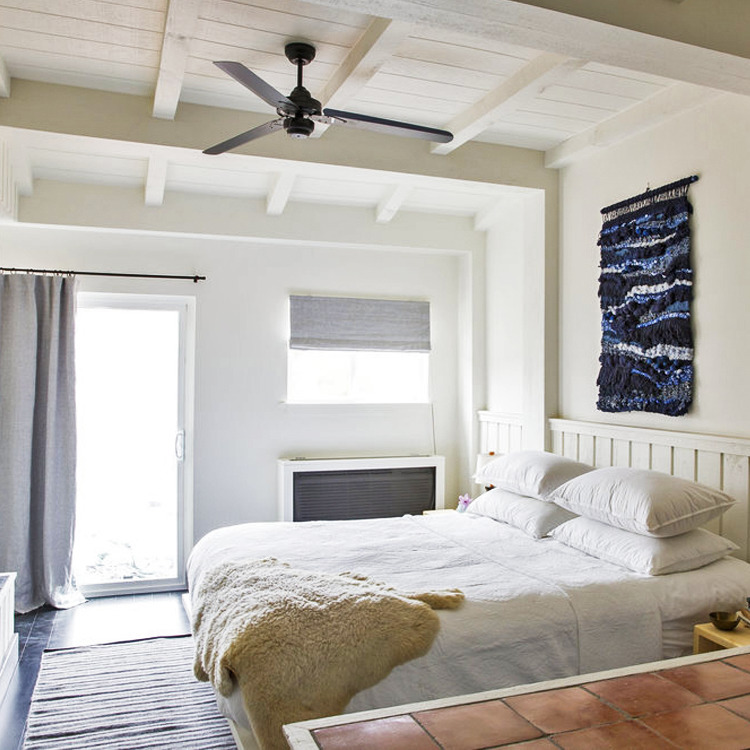 In its most recent revival designed by Studio Tack (who are also on this list for Brentwood), the lodge gets a woodsy Scandinavian-influenced makeover with blonde lumber, whitewashed walls, and textile accents. 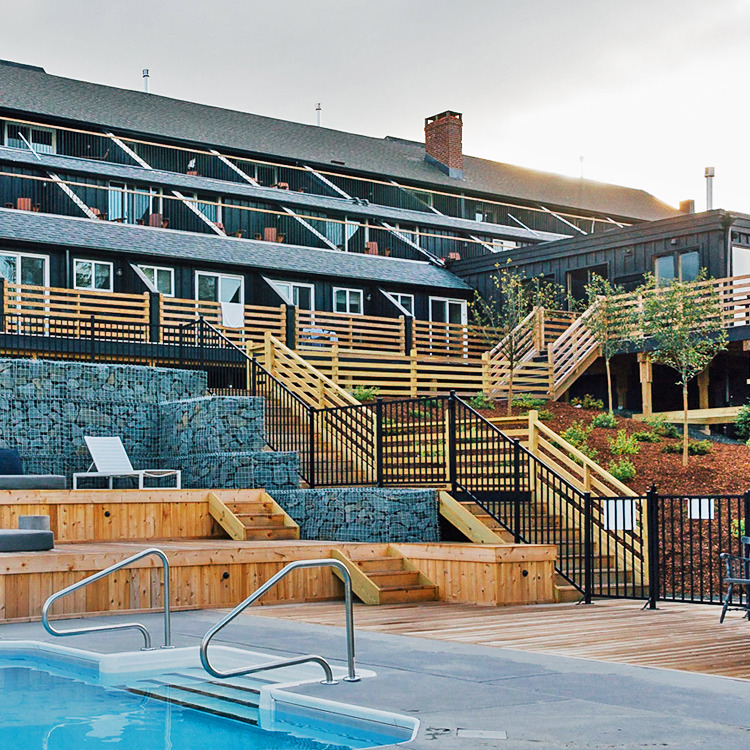 There are 38 guestrooms and suites, a heated outdoor pool, nightly bonfires, and on-site restaurant featuring a Swiss-inspired menu. Two standard rooms are suitable for wheelchair-users. 9 River Road was originally built in 1884 as a family home and furniture store, and then later served as a boarding house in the 1930's. It's now in the hands of its third owner, the Fosters, an upstate-based hospitality company also behind The Arnold House (next on this list), North Branch Inn, and The Debruce. 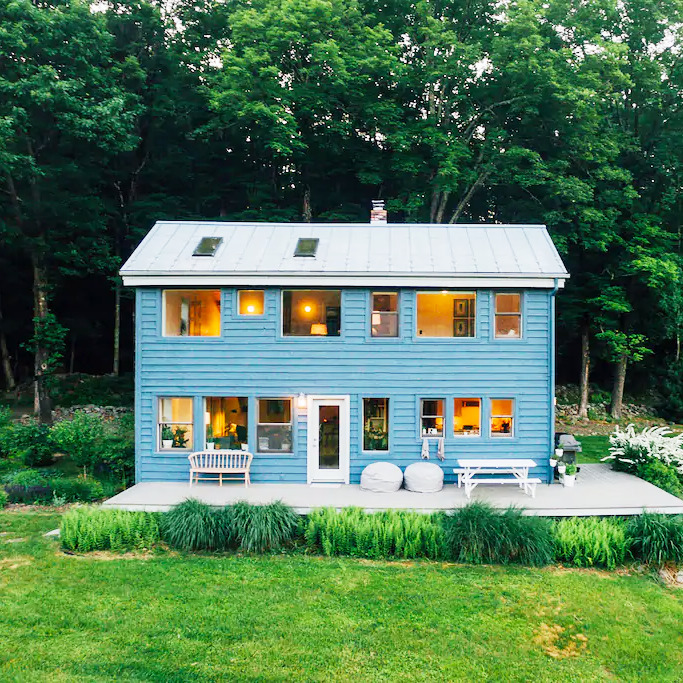 9 River Road features 8 bright guest rooms and some cozy common areas like the kitchen (where you'll check in) and porch. 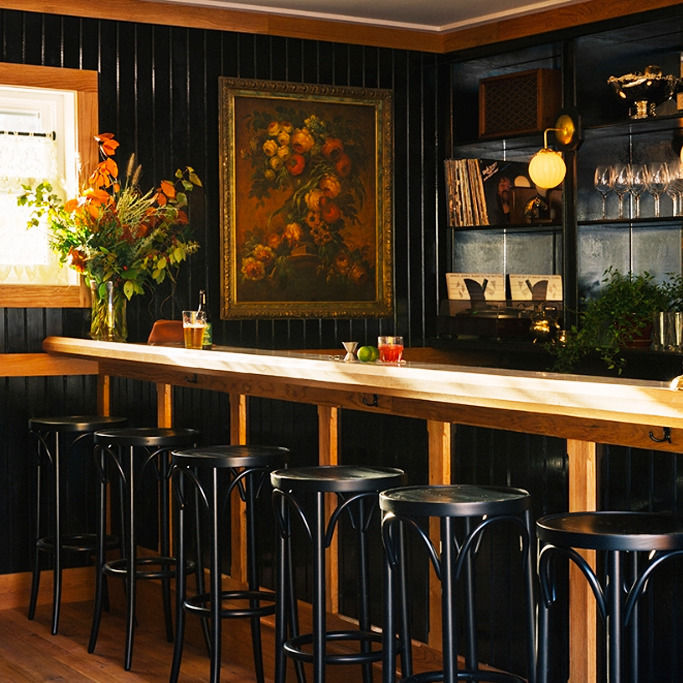 Your stay at 9 River Road also includes free use of their bikes so you can fully explore the border town of Calicoon. There are two ground floor rooms and a paved entrance. 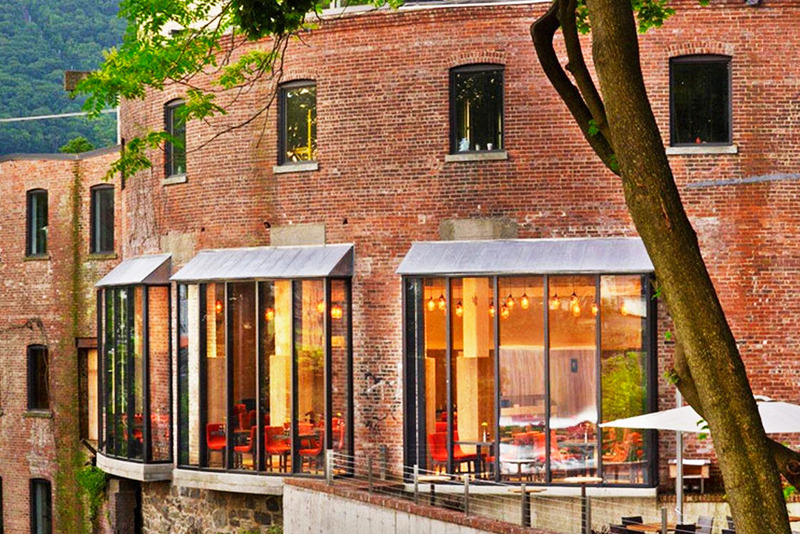 The Arnold House was the first boutique hotel opened by Foster Supply Hospitality group (the team behind 9 River Road, listed above). 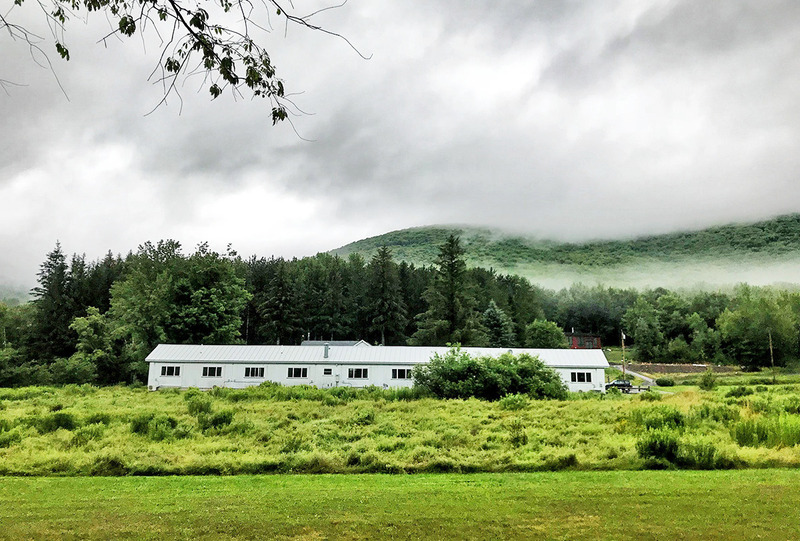 The Foster family itself goes back five generations in Livingston Manor, a hamlet to the west of The Catskills. The Arnold House consists of 13 rooms spread across three buildings, as well as a bookable Lake House located up the road from the main building. 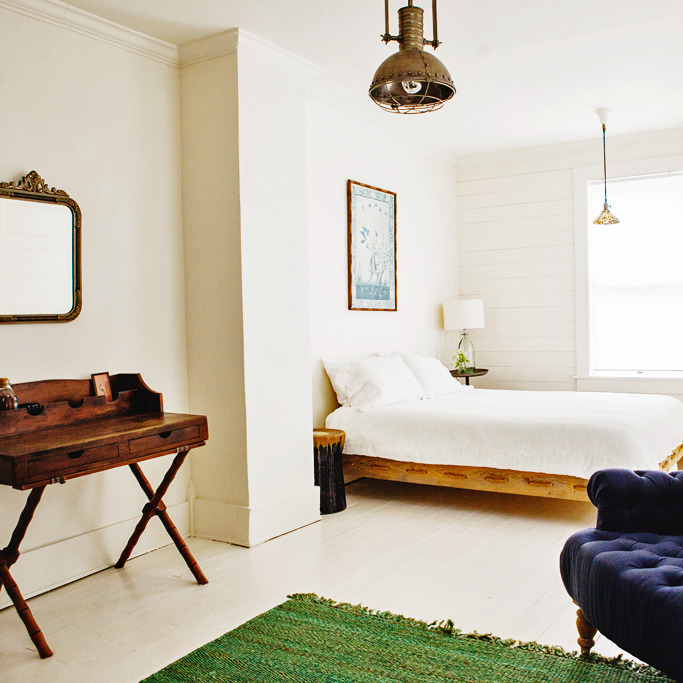 The rooms manage to keep their vintage charm with antique furniture and their original wooden floors. 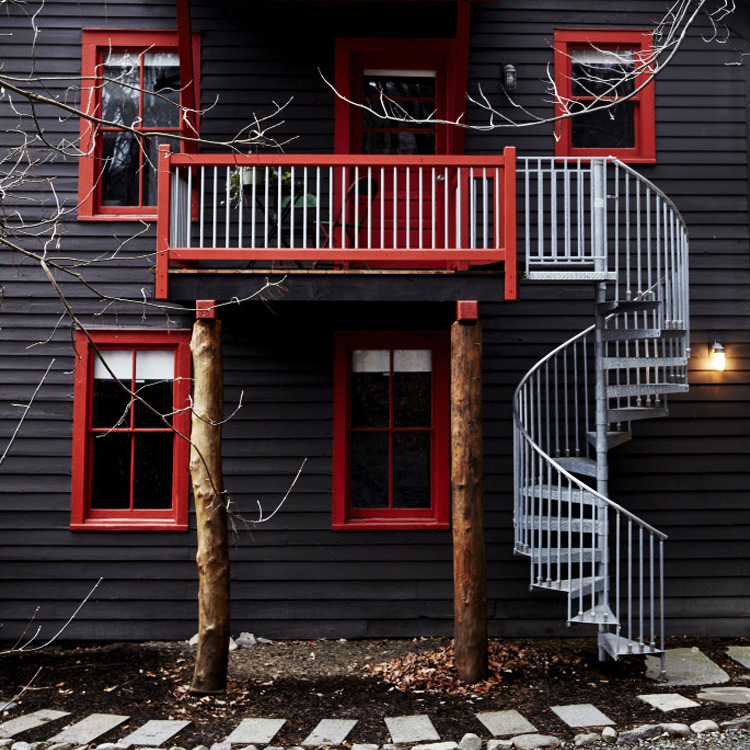 If you plan your stay in the spring you may be lucky enough to partake in the Arnold House's ramp picking weekend. The rooms in the main building are all located on the second floor. However, there is a ground-floor unit in the Garden House. Please reach out directly to the hotel for more accessibility information. 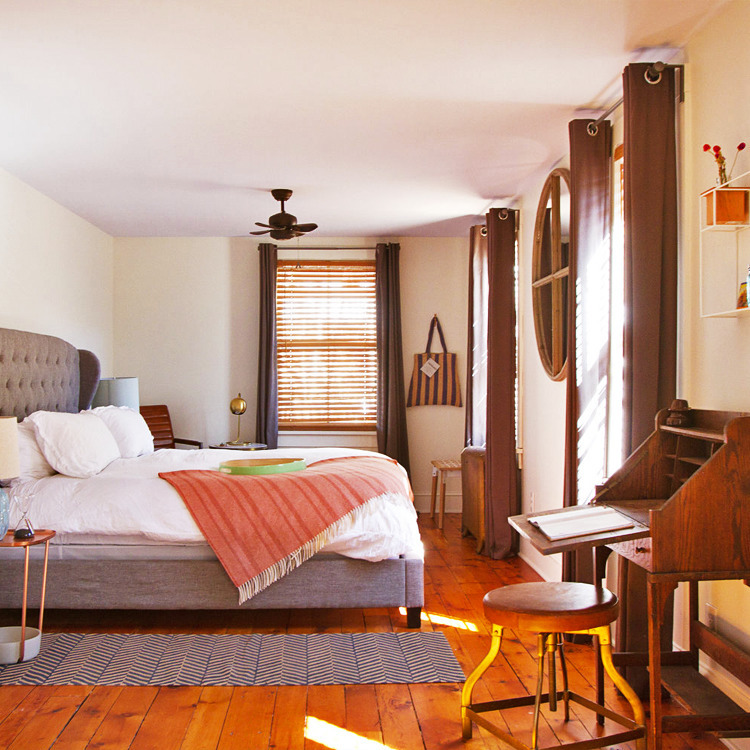 Kate's Lazy Meadow is a renovated motel with a famous founder. 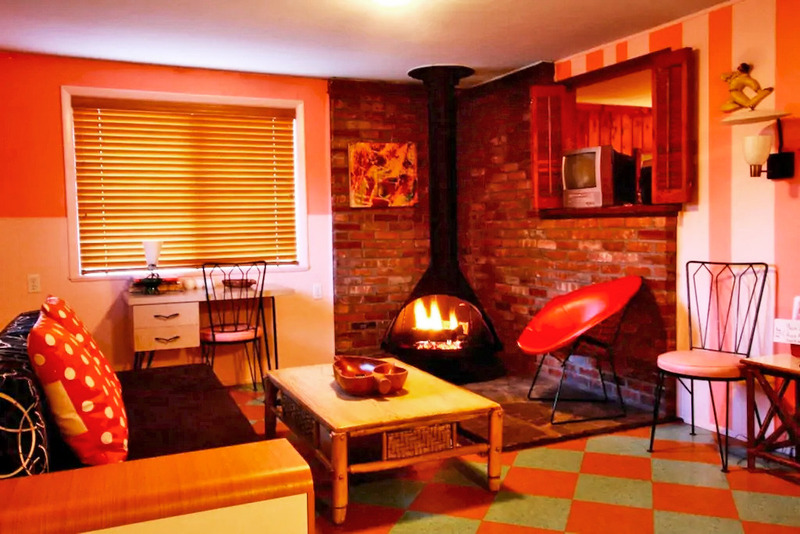 The kitschy, psychedelic interior design all makes sense when you realize that this is the baby and brainchild of Kate Pierson of the B-52s. 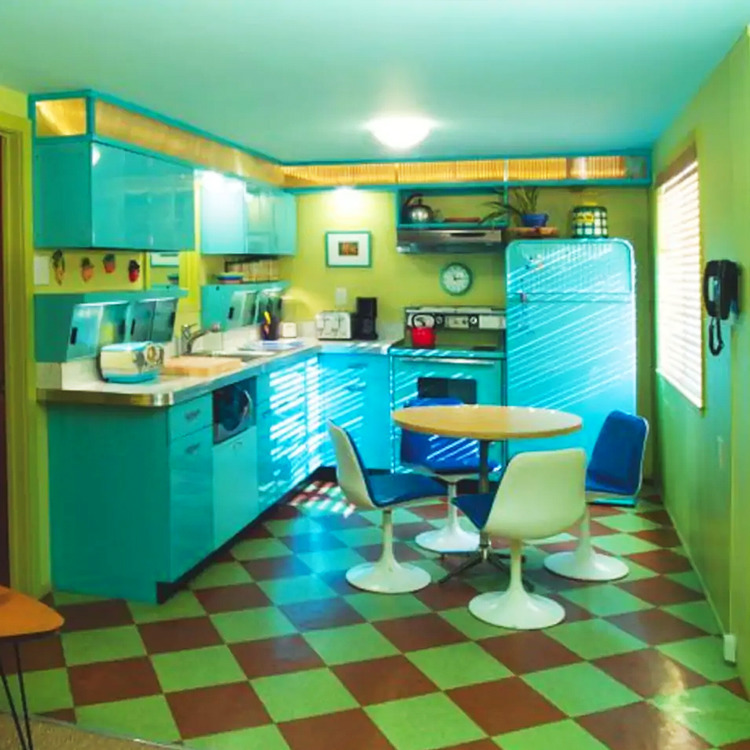 The motel rooms channel "Love Shack" vibes with their colorful vintage kitchens and space-age decor (very Jetsons-do-Woodstock, which is only a 15 minute drive away from the meadow). 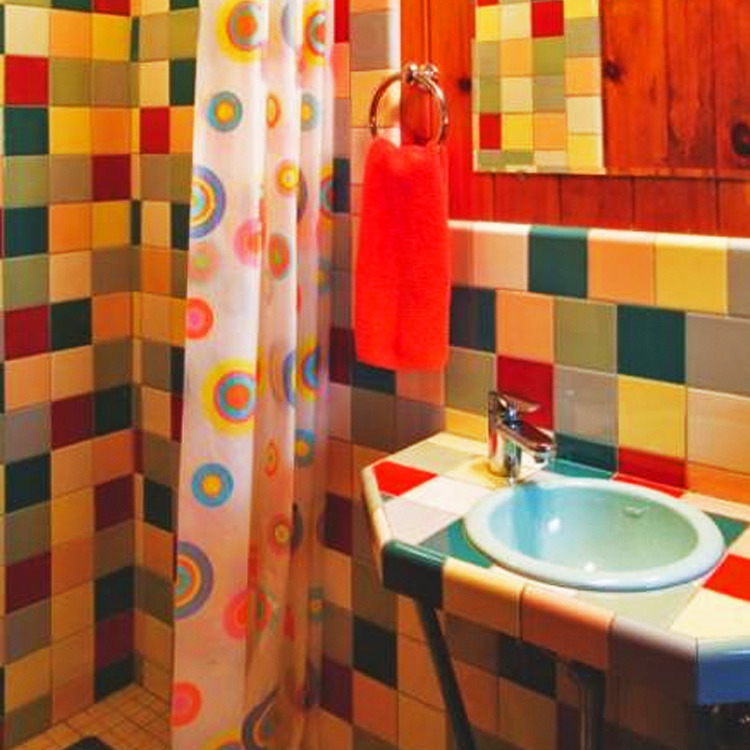 In addition to the motel rooms, Kate's complex also includes a separate cabin and lodge for groups to rent. All units in the main motel building are on the ground floor. 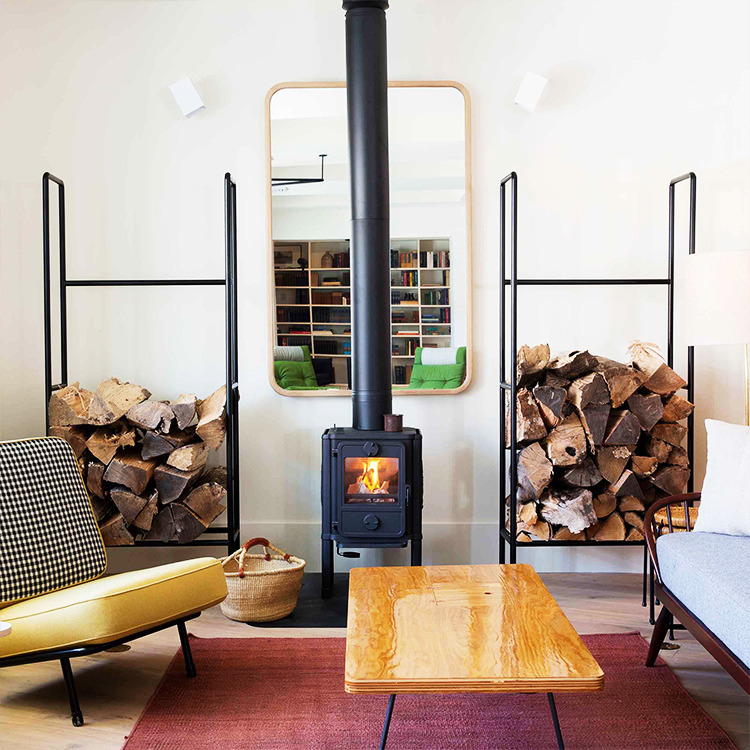 If there's a hotel on this list you may have heard of, it's probably Rivertown Lodge, which has received a lot of press and accolades for its transformation of a former movie theater and motel into a 27-room oasis and "public living room" that's a showcase of Hudson's local artisans. 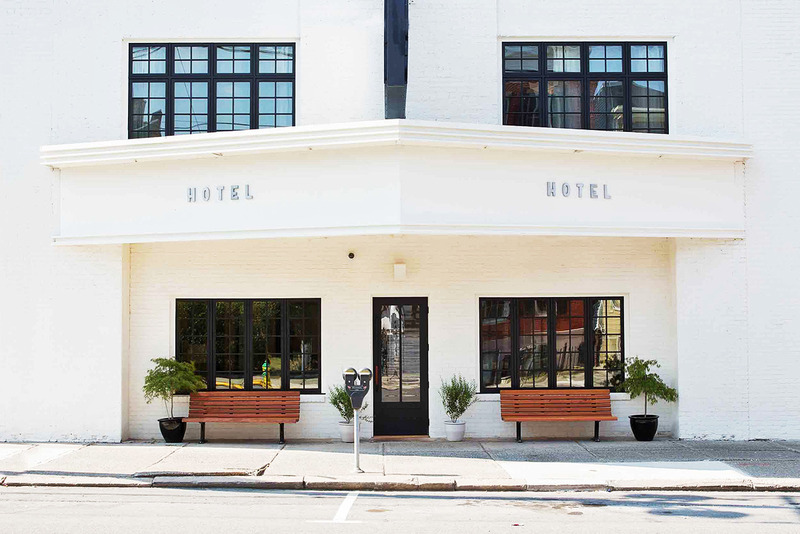 The hotel was designed by Brooklyn studio Workstead, who have worked on The Wythe Hotel as well as The Dewberry in Charleston (featured in our Valentine's Day post). 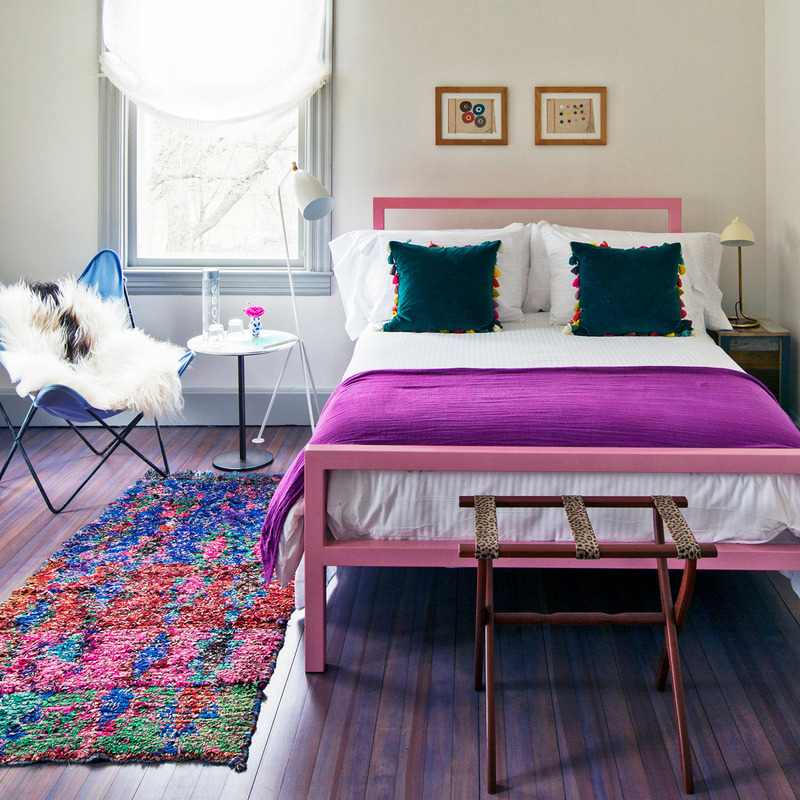 Some of the rooms have unusual layouts— a problem the owners solved by building beds directly into them. 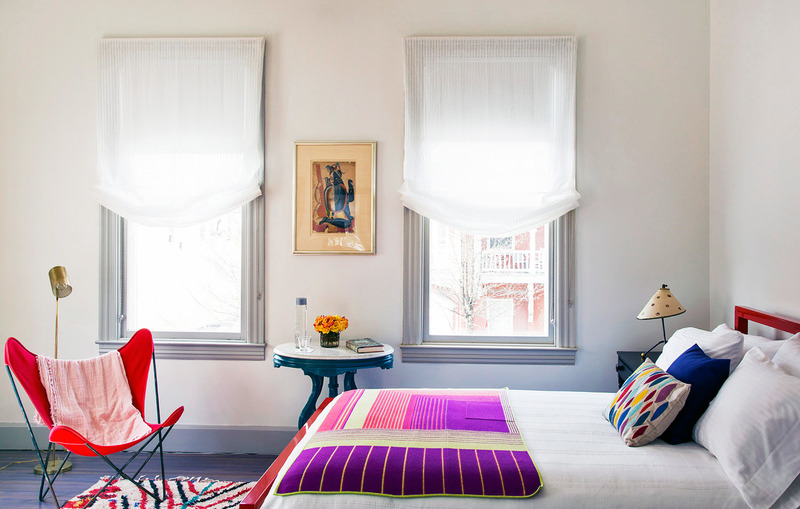 Though these tend to be smaller rooms, they have since become fan favorites and are the first snapped up by guests. Units are located on the second floor and accessible via stairs. 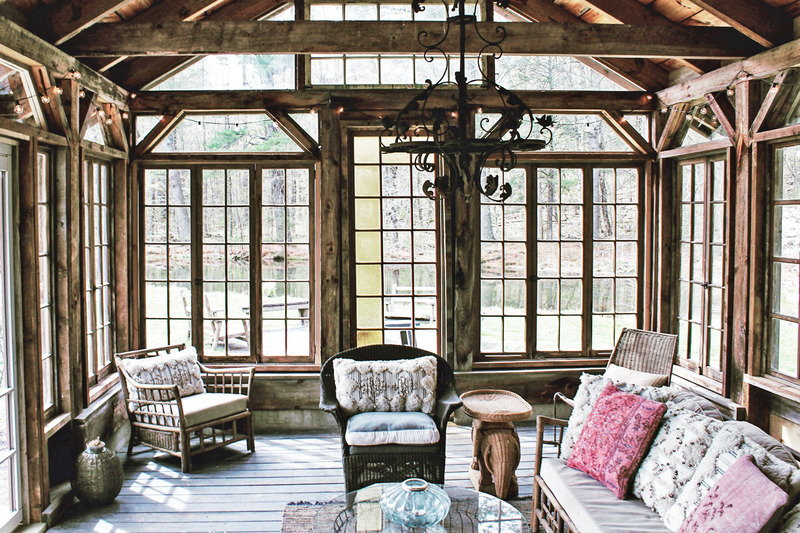 I originally featured The Roundhouse in our Valentine's Day post, so this place truly has year-round charm. If you're a minimalist who wants an unobstructed view of the changing leaves then The Roundhouse is perfect you. 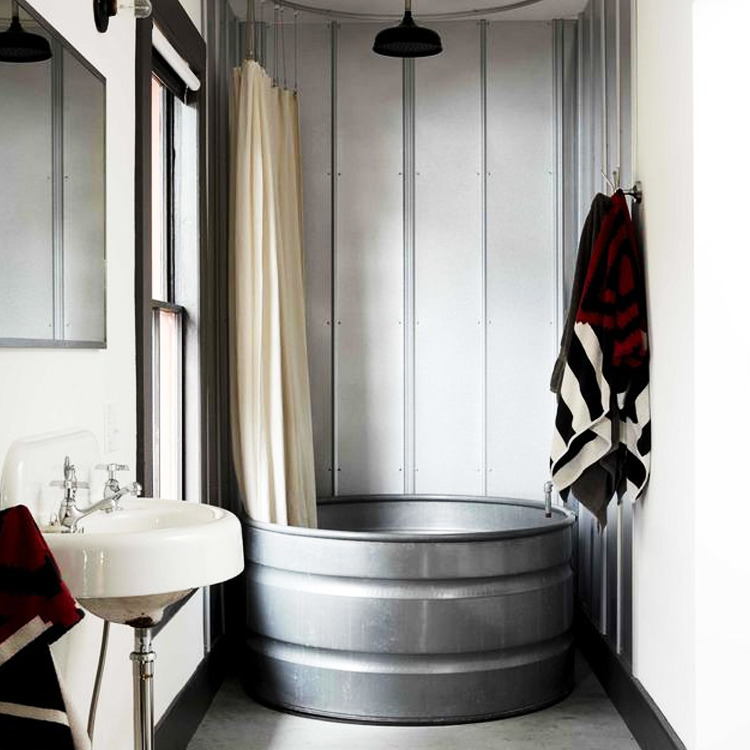 It may even be worth splurging for a room with a circular tub overlooking the window. 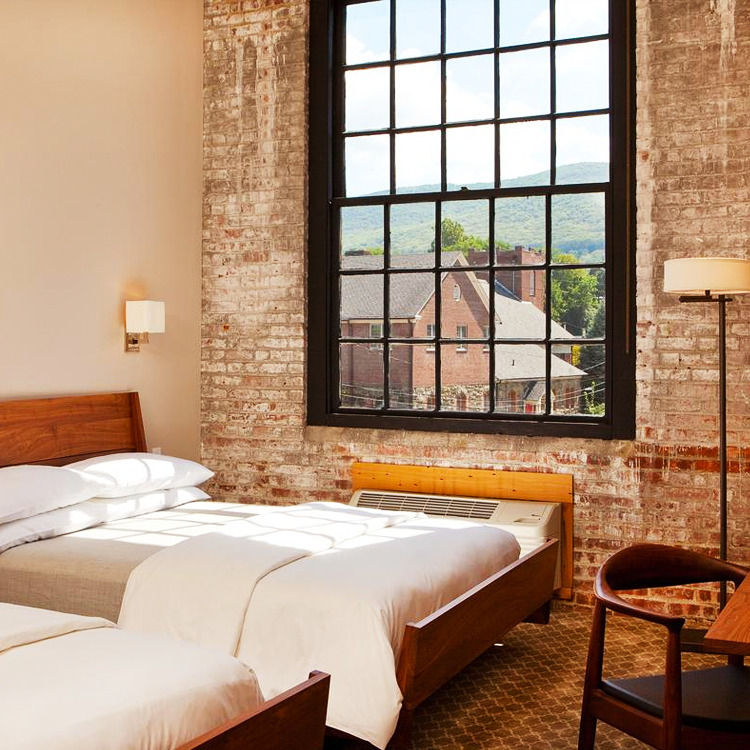 Beacon is only two hours north of the city and while you're there you can hit up the famous Dia:Beacon museum— the MTA even sells a package that includes both your round-trip transportation on the MetroNorth as well the museum admission. Roundhouse has facilities for guests with disabilities. 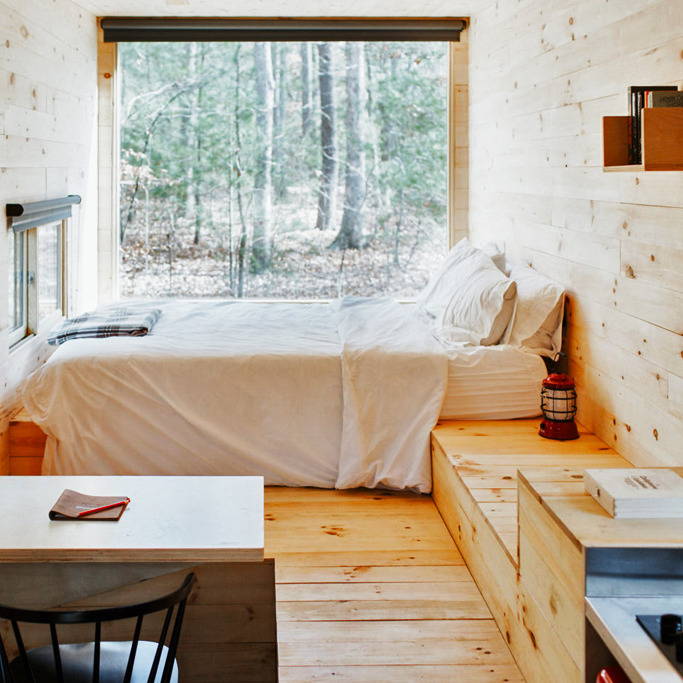 A Tiny House Resort is another collective of custom-designed modern campers (similar to Getaway, listed earlier). 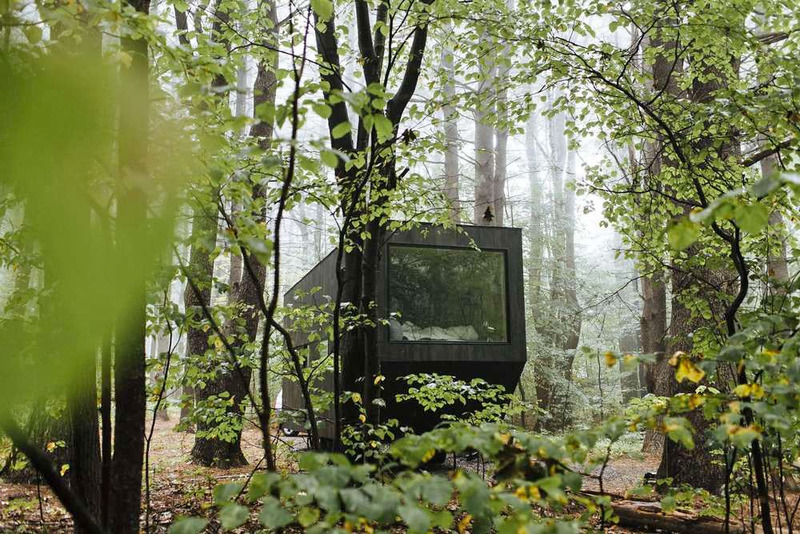 These are located in South Cairo, a town in the northern Catskills, and sit overlooking the picturesque Catskill Creek. 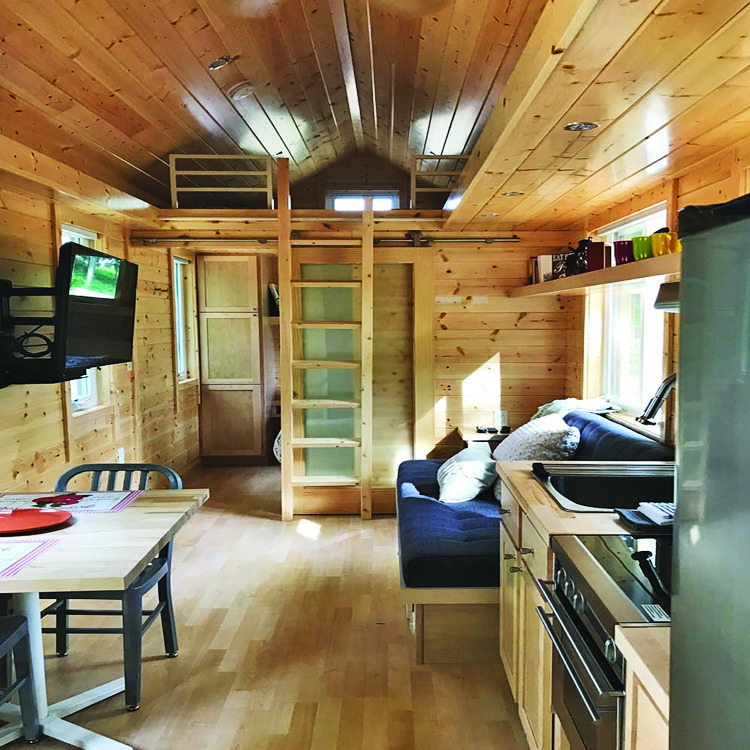 The campers were designed with the "tiny house" lifestyle in mind, and while most are rustic yet minimal, there's even a "lux" option for those who don't want to leave behind their creature comforts. Most of the campers are priced the same regardless of their occupancy, meaning you can either get cozy with a group of friends to save money, or pay a premium for your own space. They do have one smaller camper, "The Green Bean", for two that is priced cheaper. 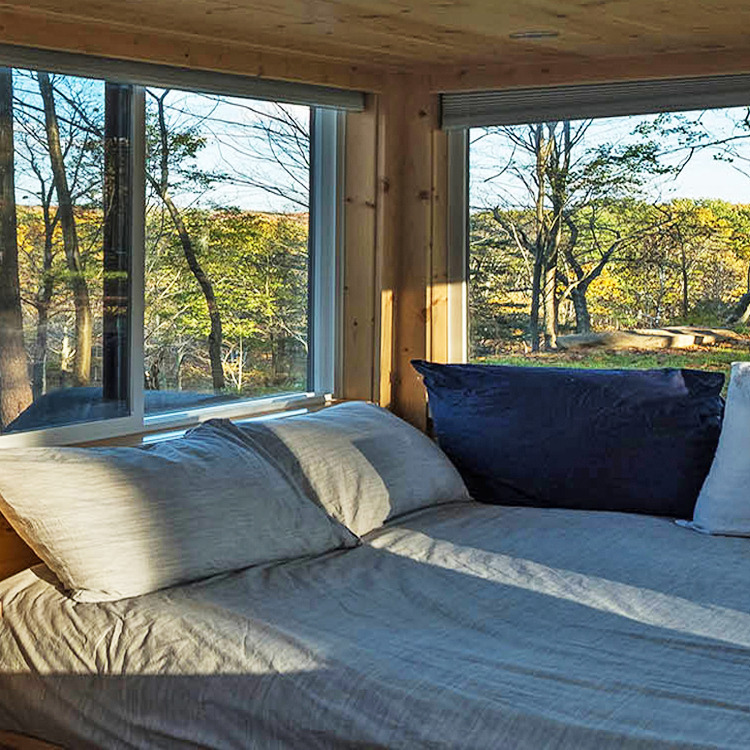 Cabins are elevated and accessible via a few short steps, and surrounded by unpaved grounds. I saved my personal favorite for last. 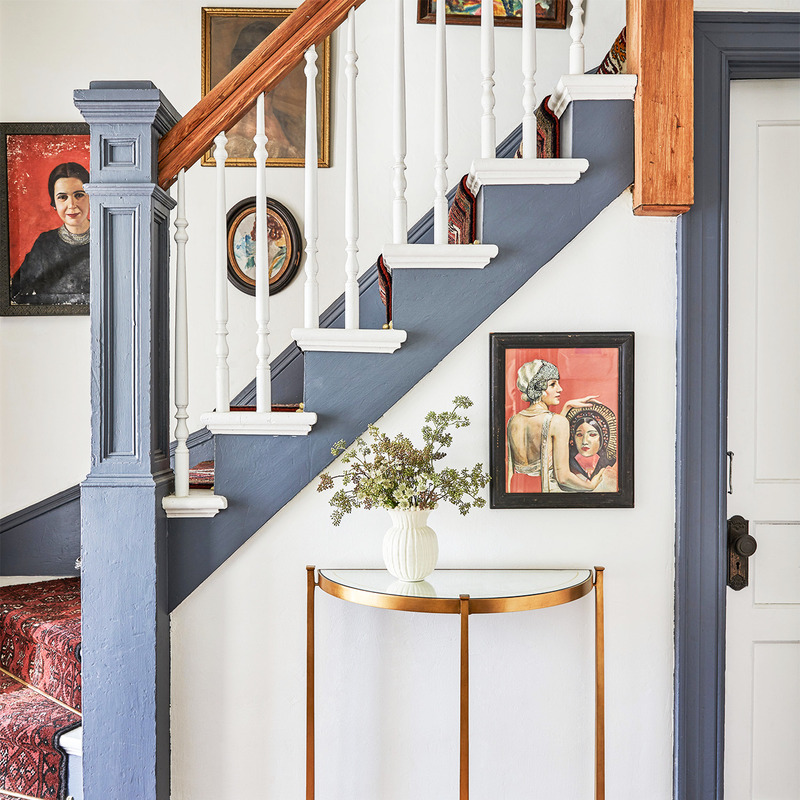 This Hudson property was originally built in 1915 and has been renovated into two separate bookable spaces for guests by a celebrated prop stylist. 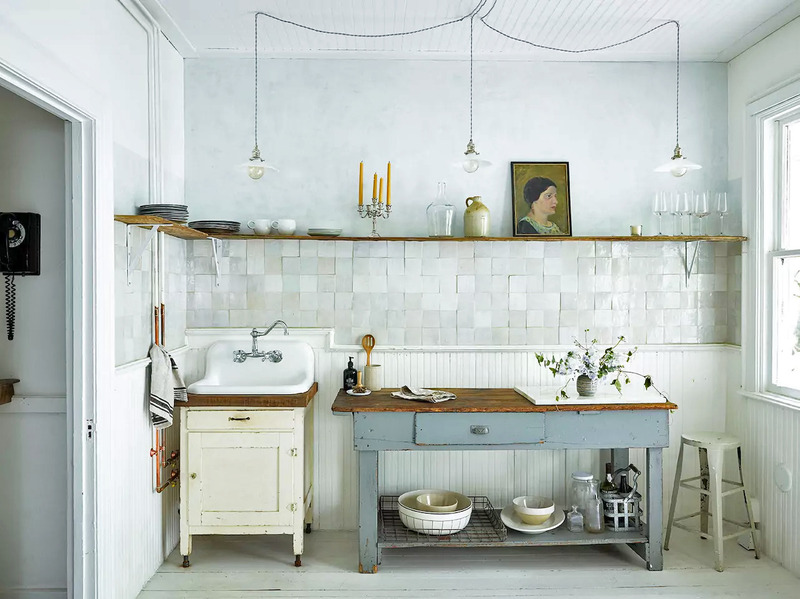 The home also serves as a studio space for his company, Zio & Sons. 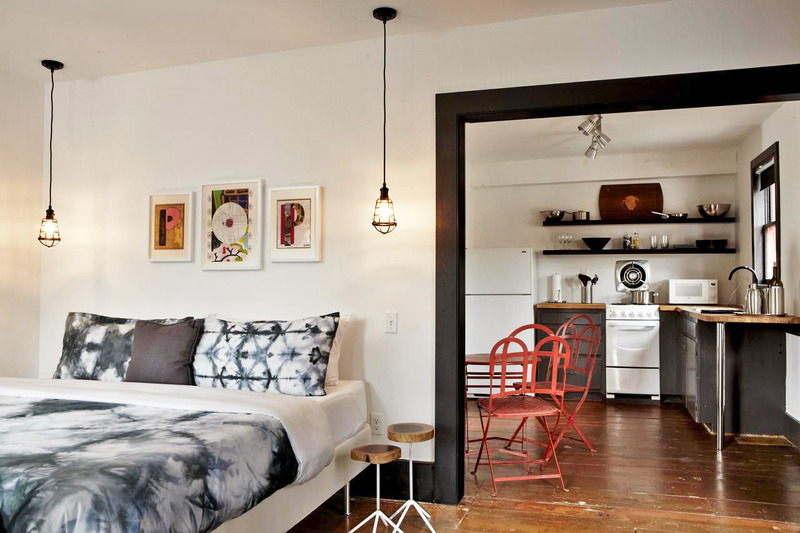 The homes all feature a clever mix of high quality materials and surprisingly affordable furniture finds. 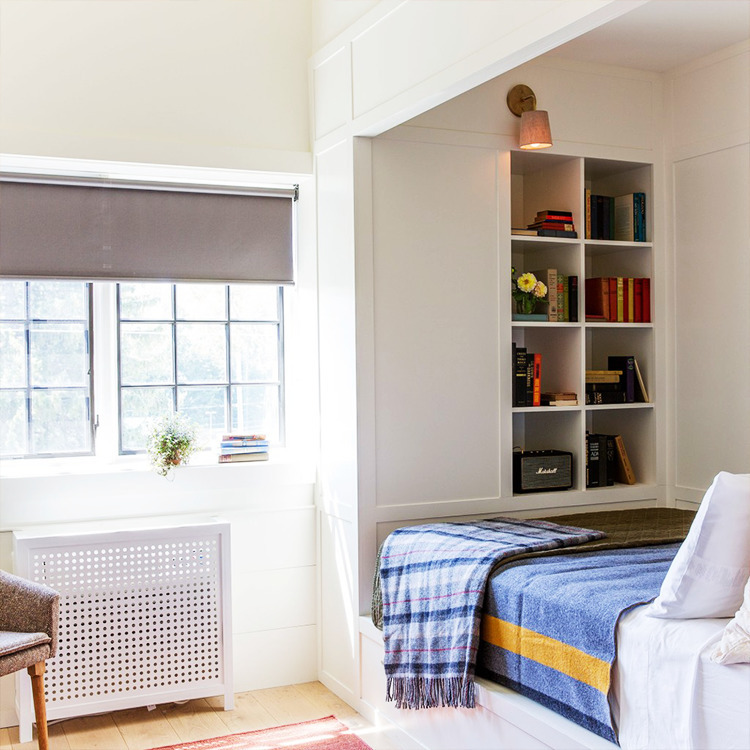 The 1,300 square feet upstairs studio space also includes a reading nook, dressing room, and porch. Guests also receive a cute custom-designed travel guide to the neighborhood upon arrival. 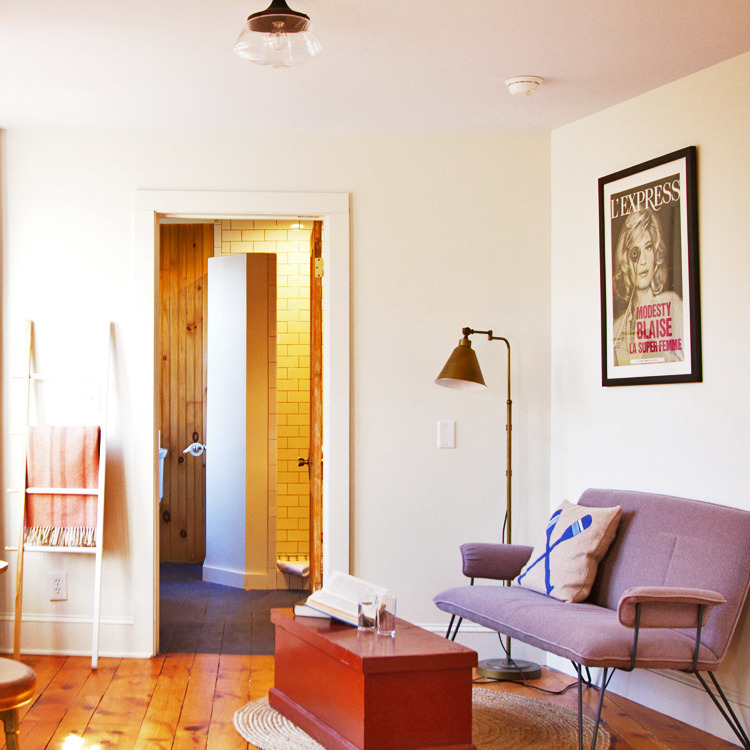 One of This Old Hudson's units is located on the ground floor, but we recommend reaching out directly to the host for more accessibility details.